I think meatloaf gets a bad rap. I'm not entirely sure why, but I have a feeling that it stems from bad cafeteria meatloaf in our childhood. Or the stuff that comes frozen in little boxes that bear pictures that only vaguely resemble the contents of the box. Maybe you tried it in some greasy spoon diner, and found that it was overly spicy, or conversely, terribly bland. Maybe someone made it for you and tried to "spice it up" by adding roasted red peppers and feta cheese, and it just...didn't....work. That's the other side of meatloaf. While some people grimace at the very thought of meatloaf, it seems that many others see something worth redeeming about the idea. Their response has been to conjure up endless variations on this American classic. There's pizza meatloaf (mix some pepperoni and green peppers in with the meat and top it with marinara and mozzarella cheese), Mexican meatloaf (add chili powder and chiles to the meat and top it with enchilada sauce and cheese), apple cinnamon turkey meatloaf (sounds weird, but if you think about it, it could work), and even cocoa crispies encrusted meatloaf. Eww. I try not to judge before tasting something, but.....ewwww. Heat up about 1 tsp of oil and cook a diced onion in it. You're just trying to get it soft. 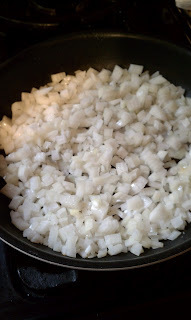 I don't like crunchy or even firm onion pieces in meatloaf, and neither does my family. Yeah, the onion will cook in the oven (mixed into the meatloaf), but not enough for my liking. So I give it a good head start. 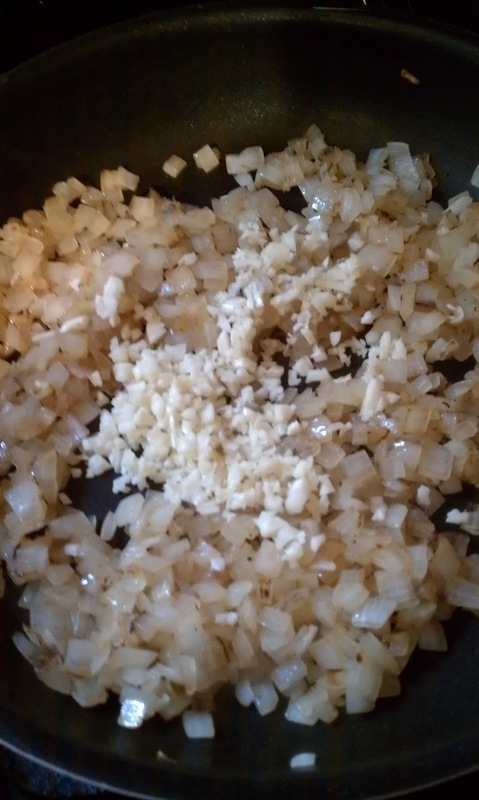 Once the onion is soft and only a little brown, add some minced garlic and toss it around for about 20 seconds. At this point, you will smell the garlic. Yummy. Turn the heat off and continue to stir for a few minutes. Stirring it will keep the garlic from burning. Now just set the pan aside to cool for a few minutes. Now, get a big bowl out. I have these two stainless steel bowls that I use for mixing all kinds of things. I always used to use plastic salad bowls, because it was all I had. You wouldn't believe how excited I was when I saw these stainless bowls on clearance at Meijer. Yes, stainless steel mixing bowls were a dream come true for me. What of it? Anyway, you're going to throw a bunch of stuff into the big bowl. Yummy! Okay, not really. And please, no votes on what this looks like. It's just ketchupy crackers. Although, it should actually be a little more orangey, since there should be a couple of eggs in there. I forgot. Until just before the meatloaf went in the oven. Bummer. But all's well that ends well. I remembered before the point of no return. Okay, now some people just put the meat in the bowl, then throw everything on top of it and mix it all together. That's fine. It works. But I do think it leads to over-mixing....almost kneading. And that makes the meatloaf tough. 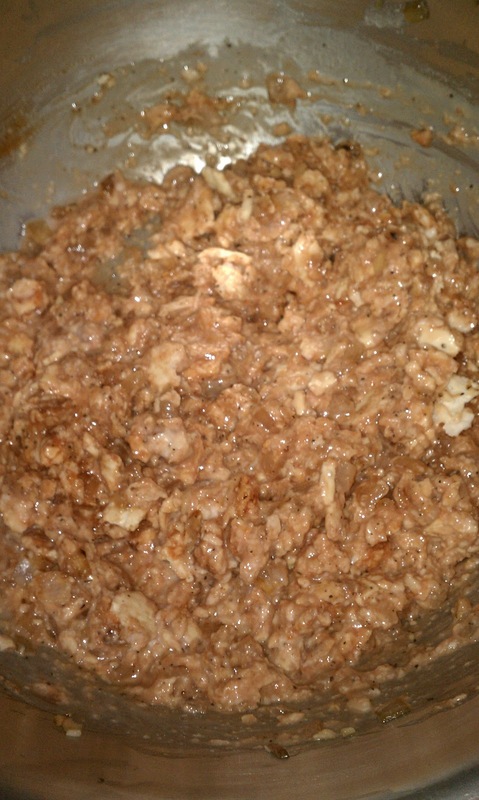 It also tends to leave pockets of dry saltine, or scrambled egg in the mix. That's not appetizing. So I like to mix it all together. It ensures that the crackers are moistened well, which then helps the meatloaf stay moist, and that the eggs and seasonings are well distributed throughout the loaf. 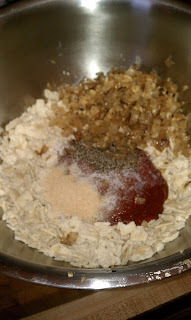 Now crumble the ground beef over the mixture. Again, crumbling it rather than just plopping the whole package into the bowl, will allow you to more gently mix everything together, leaving you with a more tender meatloaf. 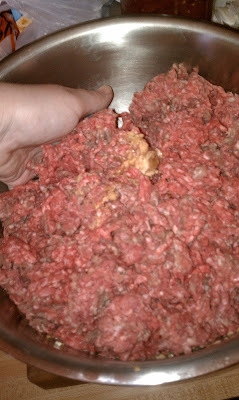 You can use whichever ground beef you like, but I use either all ground chuck, or if ground sirloin is on sale, I will mix chuck and sirloin evenly. Now it's time to get your hands in there. It's a good idea to take off your rings, because gunk can get stuck in the little tines. That's what I've heard, anyway. 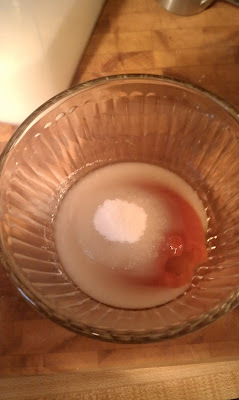 Slide your fingers down along the side of the bowl and pick up the goo with your fingers, and then sort of turn it all over, over and over again. You want to sort of fold, rather than knead. A little squeezing is fine and even necessary, but this isn't bread dough. First, you can have hot meatloaf sandwiches. 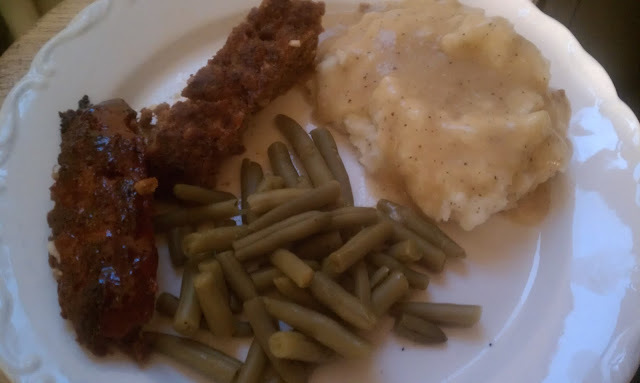 Just reheat the meatloaf in slices, along with the mashed potatoes and gravy. Then lay some meatloaf on a piece of bread, put some potatoes next to it, and cover the whole thing with gravy. No, it's not sophisticated. Possibly not the healthiest meal ever. It rather reminds me of "family restaurant" fare. But then, when was the last time you walked away from a "family restaurant" hungry? Yep, it's yummy. But the best part is still to come. Oh, the wonders of cold meatloaf sandwiches for lunch. Jeff was very excited about having meatloaf on a Friday, because he drives on Saturday, and he was looking forward to having meatloaf sandwiches to take along with him. Don't scoff. You must try it. And here's how you make it: Sandwich bread. Miracle Whip on both sides. Slices of meatloaf in the middle. That's it. And yes, I said Miracle Whip. I like mayo as much as the next guy, but there are some sandwiches that just need the tangy zip of Miracle Whip, and mayo will not do. Bologna is one. Meatloaf is the other. But I digress. 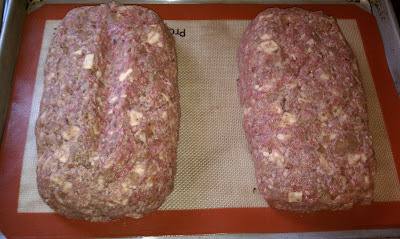 We must bake the meatloaf, eat it, and sleep a night before discovering the beauty of a meatloaf sandwich. Okay, so take half of the meatloaf mixture, and get it ready for the oven. You can do this any way that you like. I've seen it mashed flat into a baking pan. I would think that the double batch would fit into a 9"x13" pan. 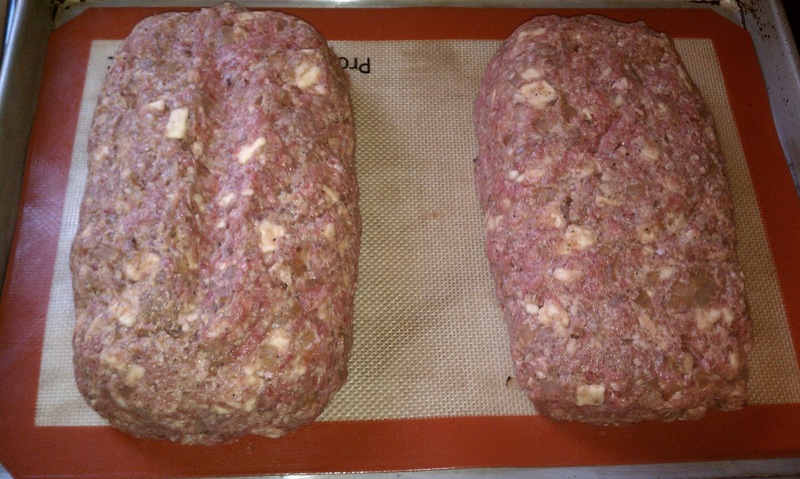 But I bake meatloaf one of two ways: In a loaf pan, or free form. Loaf pans are convenient. Just mash the mixture down, making sure that there are no air pockets, and bake. There are two problems with this, though. First, the meatloaf basically swims in fat. Once it is cooked, you'll see that it has pulled away from the sides of the pan, and the fat that cooks out has no place else to go, so just surrounds the meatloaf. Second, it only allows the top to brown. For me, the best part of the meatloaf is the brown crust. So I want as much of it as possible. Therefore, free form is my favorite. 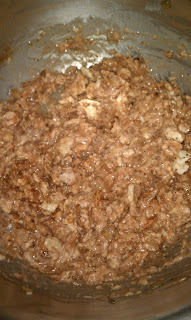 So, take each half of the mixture are form your loaves, just using your hands. Make sure that the ends are fairly squared off, and that the top doesn't mound up too much. It should be uniformly thick. Otherwise, the ends or sides that are skinnier will cook faster and end up dry before the thicker parts are cooked through. Alright, so I said I like my meatloaf plain. And that still stands. However, I make one concession. Sweet and sour glaze. It's pretty good, and it doesn't mess with the flavor of the meatloaf too much. I used to just dip it in ketchup, and this glaze is pretty much ketchup, but with a little zing. Really, it's ketchup, sugar, and vinegar. However, I only add the glaze to one meatloaf. The one for eating tonight. 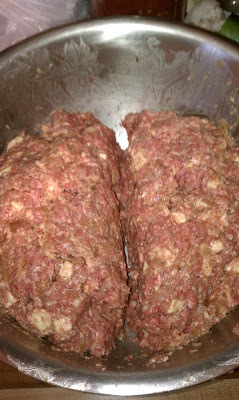 The other one must remain pure for the meatloaf sandwiches. There are limits. Can I just pause here to apologize for my "photography"? It seems that bloggers are all amazing photographers, as well. Many of them even sell their prints! And I can see that. I would buy some of them. They would be lovely in my kitchen someday. But me? I literally take pictures with my phone. I find it hard to take a picture that isn't hopelessly blurry, just because I can't hold the phone still as I am pressing the little button with my thumb. I have no idea about lighting, exposure....I can't even think of any other photography terms. So that's it. I know my pictures aren't the most appetizing. Hopefully they are at least helpful in illustrating what I am trying to explain. That's all. 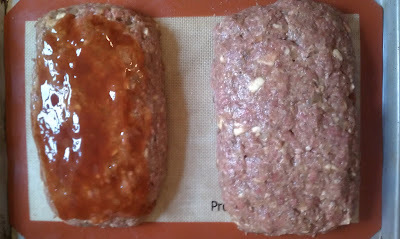 So if you are using the glaze, pour or brush half of it over the meatloaf. The other half will go on later. Pop the pan in a 350 degree oven for 45 minutes. This is the time to get your potatoes boiling. After 45 minutes, brush the rest of the glaze onto the meatloaf, and put it back in the oven for about 15 minutes. And there you have it. Nothing fancy. But so good.